Metron-MD | Chiropractic - Website of metron-md! Metron-MD is a medical imaging software includes chiropractic and podiatry. It features world class imaging algorithms, calibration and measurement tools, multi-image stitching, report generation, full DICOM compliance, and more. Metron supports a process we call “Guided Mark-Up” in order to provide a uniform way to analyze certain types of images. For example, if you have a lateral radiograph of the cervical spine or of the lumbar spine, Metron supports guided mark-up of these images plus images for the AP Spine (including lumbar, thoracic and cervical) and the AP Pelvis. The idea in guided mark-up is to follow the instructions and pick the key points in the image as Metron guides you to. Then, Metron computes several parameters from these points that were picked. Then, you choose which set of measurements you wish to display overlaid on the image. Selecting all makes quite a cluttered image, so generally you select one to four measurements that are of importance for the particular case. Atlas Angle: The angle that the major axis of C1 (from this aspect) makes with the horizontal. Atlas/Axis Angle: The perpendicular to the posterior side of the C2 body is constructed, and the angle between this constructed line and the major axis of C1. Click here for complete list of measurements. George’s Deviation: George’s line is the curve created by connection points chosen on the posterior sides of all vertebral bodies. According to some literature (based on the “Harrison Spine Model”) suggests that in the ideal case these points lie on a smooth curve which is a section of an ellipse with certain major-to-minor axis ratio. Metron’s “George’s Deviation” parameter is a sum of all the offsets from this perfect elliptical arc. A perfect value would be zero (0.0) meaning that all points lie on the ideal elliptical arc.The higher the value of this parameter, the more deviation there is from a circular arc. There is a single guided mark-up instruction to pick three points on each vertebral body. These picks are then repeated on as many vertebrae as desired. Two points are picked on symmetric features on each side of the vertebral body, and the third point is a centered feature, such as the spinous process. It is up to the user’s medical training and best judgment to pick these points in the correct locations. After completion of the guided mark-up picking for a AP radiograph of the spine vertebra, a set of 3 measures are computed. A sample set of numbers are shown here. The 3 measurements computed from the analysis of an AP view of the spine. Click the small box to the left of the parameter name, and the measurement is visualized on the radiograph with overlaid markup, which makes it easy to understand its meaning. 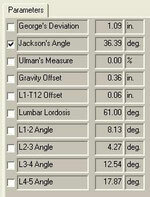 After completion of the guided mark-up picking for a lateral radiograph of the lumbar vertebra, a set of 8 measures are computed. A sample set of numbers are shown here. 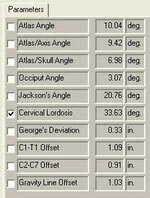 The 8 measurements computed from the analysis of an AP view of the pelvis. Click the small box to the left of the parameter name, and the measurement is visualized on the radiograph with overlaid markup, which makes it easy to understand its meaning.